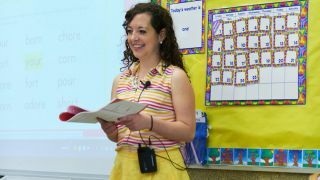 K-8 schools have lately been embracing the “A” in “AV” more, and the St. Hilary School, in Fairlawn, OH, offers an example of that, with a 32-classroom integration of 32 ATW-1301 System 10 PRO digital wireless systems from Audio-Technica. Part of a larger overall classroom audio/video/computer integration, the wireless systems included 32 ATW-1301 UniPak body-pack systems with AT831cW unidirectional lapel microphones, and two ATW-1302 handheld systems with handheld microphone/transmitters, bringing a new dimension in education audio in the form of hearing and speaking assistance. The System 10 PRO wireless were installed and integrated by MjS Electronics of Richfield, OH. Audio-Technica’s System 10 PRO Rack-Mount Digital Wireless System provides the same interference-free operation in the 2.4 GHz range (outside TV bands) as the original System 10 wireless system but with expanded features and versatility. The half-rack chassis is equipped to house two receiver units that can be operated locally or released from the chassis and mounted remotely (up to 328 feet away) via Ethernet cable. Up to five chassis (10 receiver units) can be linked using the RJ12 cable included with each system, creating a stable, multichannel system with the simultaneous use of up to 10 channels. Like all the products in the System 10 wireless family, the PRO rack-mount features 24-bit operation, easy setup, clear, natural sound quality, and three levels of diversity assurance: frequency, time, and space. Frequency Diversity sends the signal on two dynamically allocated frequencies for interference-free communication. Time Diversity sends the signal in multiple time slots to maximize immunity to multipath interference. Space Diversity uses two antennas on each transmitter and receiver unit to maximize signal integrity. Each System 10 PRO rack-mount system includes an ATW-RC13 receiver chassis with rack-mount adapters, one or two ATW-RU13 receiver units with corresponding AT8690 receiver unit mounting brackets, a joining plate (for dual-channel systems only), one RJ12 cable, one AC adapter, and one or two ATW-T1001 UniPak® body-pack or ATW-T1002 handheld transmitters, or one of each. Both the receiver chassis and transmitters feature easy-to-read displays. These systems are also available in headworn and lavalier microphone configurations.